This time of year is beautiful at Durham Central Park. The grass is green, the sunlight is special and the gardens are full of vibrant color. The landscaping hasn’t always been this beautiful but now it is more the norm because of several individuals, businesses and organizations who have ‘adopted’ specific areas in the park as well as the monthly volunteer days that happen throughout the year. Each DCP area adoption is different and has its own story. What we informally call the ‘Prudential Garden’ is a great example of how things happen around the Park. It started as a way to commemorate the loss of a friend and has become a showcase garden as well as an ongoing teambuilding project for a community minded business. 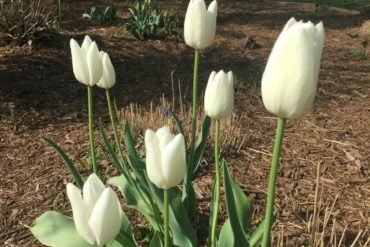 Tracey Goetz explains why the realtors at Prudential Carolinas Realty love working in their garden at DCP. “Over nine years ago we made a decision to do our part in Durham Central Park. Being in the real estate business, we know the importance of making Durham beautiful. 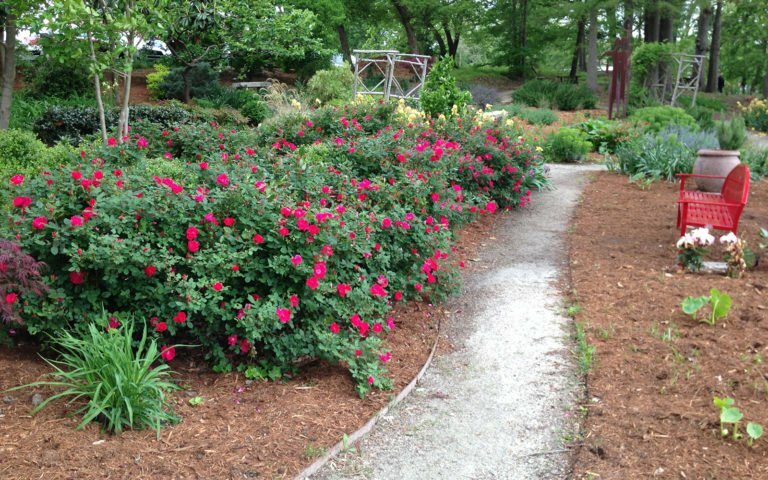 By creating and maintaining a garden in Durham Central Park we help to accomplish that goal. And by doing it as a collective team, we see immediate results and have watched it grow over the years. When this project first began, there are stories of the realtors taking turns coming over to the park throughout the summer to water the garden. That was no easy job as all the water had to be hauled up the hill from the Pavilion below which meant lots of hoses stuck together, watering the garden and then replacing all the hoses below….Lots of heavy lifting. We were all happy when about five years ago, Prudential and other DCP supporters raised the money to put in an irrigation system at the park that now waters the gardens during the summer. Every year the realtors who work for Prudential Carolinas Realty get together for a work day at the garden that starts with a meeting to learn something about this area of Durham. One year I led a walk throughout the five acre park to tell them a few of the stories that make up the history of Durham Central Park. Other the years they have had other folks from the area educate them on the Central Park District. Then they roll up their sleeves and get to work planting, mulching and lots of weeding! And they raise the money every year to supply the garden with new plants, mulch and hardscape. This year one of the Meals From the Market dinners (DCP’s main yearly fundraiser) was a Square Dance at the Pavilion that raised some money for the maintenance of the garden. The wonderful thing about Durham Central Park is that it is truly a community effort. Lots of people throughout our community take personal ownership of the park and really consider it ‘their’ park – which it is! If you have a group/company that needs a good teambuilding focus, let me know…we have a few more areas that need adopting. You’ll be helping Durham Central Park get even better …and have lots of fun along the way!